The Sumpvee Version 4.18 custom camper van rental is the larger of two Ram Promasters available from 828Campervanrental.com. 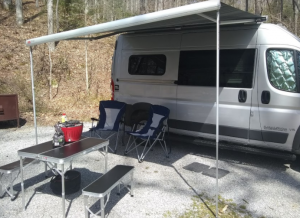 It is a Ram Promaster 3500 EXT featuring 21″ of total length and full custom conversion inside. Amenities include full galley kitchen, indoor plumbing, single source heat and solar for that off-the-grid, no-campground-required experience. . . read more below or click here to book this van now! This custom camper van rental is a Class B vehicle featuring European styling. It is set up to operate independently of camp grounds and shore connections (connections are still included). It features a full galley kitchen and seating area which converts to sleeping platforms. The seating area also include a table with room for four as well as heat and air-conditioning. Power systems are backed by a full solar system and batteries. Also available with rental through Outdoorsy.com are road side assistance and insurance. Roadside assistance includes help with breakdowns and financial protection from such occurrences. Vehicle insurance covers liability and damages up to $1 million for qualified clientele. Extra’s and add-on’s are available including bikes, motorcycles, camping gear, kayaks and more. Rates are competitive for a vehicle of this type with discounts for extended rentals. The minimum rental is two (2) nights with a moderate cancellation policy. Check our listing at Outdoorsy.com for pricing and availability. 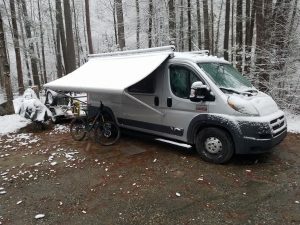 If the van you want is not available we do have others and offer special pricing in/out of season and for extended use. 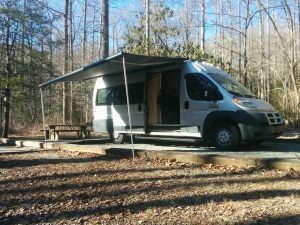 Our vans are available to rent through Outdoorsy.com. They offer a complete platform to handle booking, payment processing, customer satisfaction, roadside assistance and vehicle insurance. 25% of the total cost of the reservation, plus the service fee, will be charged as a deposit. This deposit is not refundable. The remainder will be charged 14 days before pickup. A 50% refund will be issued for the unused days when cancelled less than seven days before pickup.